This article caught my eye; since fat loss/weight loss is something that I am working on. Perhaps it will be of use to you as well. I did not write it. M. Nicole Nazzaro did. A link to the actual article is at the bottom of the post. Despite all the miles we log, races we run, and fudge brownies we forego, runners can still gain weight. When we decide to shed those extra pounds, we typically track our progress by stepping on the bathroom scale. But sometimes seeing our weight flash up at us day after day can be more of a hindrance than help—especially if those figures have barely budged. On the bright side, runners like numbers (think of all those personal records, marathon pace charts, and meticulously timed interval workouts). And there are plenty of other stats out there that can give us a more complete picture of our overall health and help us lose weight. By tracking numbers that gauge changes in our fitness level, heart health, nutrition habits, and body measurements, you'll not only slim down, but also take your running to the next level. So forget about pounds for a while and kick-start your weight loss by following these numbers instead. Set realistic resolutions and you can shed pounds for the long run. Keeping tabs on your body composition can help you assess your weight-loss and fitness progress in a way that the scale (which measures only pounds) can't duplicate. These numbers will help you focus on losing fat, gaining muscle, and getting leaner — the best indicators of improved health and fitness. Many runners get frustrated when they step on the scale after weeks of exercising only to discover they're the same weight. 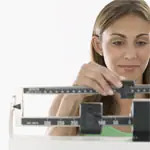 What they're forgetting is that they very likely have gained muscle and lost body fat — arguably a more positive health change than losing pounds. You can use inexpensive calipers like those from AccuMeasure Fitness to track body-fat changes. Take the measurement about one inch above your right hip. The calipers come with a chart you can then use to find your body-fat percentage. Levels for fit athletes range from about five percent to 17 percent for men and 13 percent to 24 percent for women. Taking your waist, hip, and thigh measurements on a weekly basis will help you quantify exactly how many inches you've lost. And a smaller waist is not only a marker of weight loss but also decreased cancer risk; the American Institute for Cancer Research notes that men are at a higher risk of cancer when their waist is 40 inches or larger; for women, the number is 35. Counting the extra belt holes you cinch up is an easy way to get daily feedback on your weight. "It was always a minor triumph when I realized my usual belt hole wasn't working anymore," says Jason Logue, a 36-year-old runner and attorney from Pittsburgh. In fact, many other runners interviewed for this article first noticed their progress when they had to pull their belts tighter — or buy a smaller one. Take that old pair of jeans you wore when you were at your desired weight and try them on periodically. Once they fit, you'll know you're at a healthy weight. Shanti Sosienski, author of Women Who Run, followed a similar approach. The Idaho-based runner used clothing sizes to measure progress. She went from a size 14 to a size eight — and dropped 15 pounds along the way. Looking to shed pounds? Follow this exclusive online runner's guide to weight loss. Okay, this isn't exactly a measurement, but it is a sign your hard work is paying off. Logue didn't realize how much he'd lost until friends started to tease him. "They called me David Byrne, after the Talking Heads singer with baggy suits," he says with a laugh. He bought new suits, new belts — and inspired a few friends to shed their extra pounds. Tracking numbers that assess your cardiovascular condition will give you a clear picture of your overall fitness. The stronger your heart, the harder you can exercise. And the harder you can exercise, the more calories you'll burn during your workouts. But there's another reason to monitor your heart health. As you become fitter, your body will build more muscle. A pound of muscle burns more calories than a pound of fat, so increasing your muscle mass allows you to burn more calories at rest. You can easily measure all of these numbers with a heart-rate monitor. In some cases, the rate at which the numbers change over time matters more than the actual figures. Once a week, take your pulse for one minute first thing in the morning the day after a rest day. Compare the number weekly. You'll start to see trends (for example, a slightly higher RHR may indicate you're dehydrated). If your resting heart rate gradually decreases over time, it means you're getting fitter. Tracking how quickly your heart rebounds from a serious physical effort can help you benchmark your cardiovascular strength. Chris Crowley, coauthor of the Younger Next Year book series (written with Henry S. Lodge, M.D. ), explains: "It's a common-sense correlation between your recovery rate and what kind of shape you're in." The faster your heart recovers, the fitter you are. To measure yours, warm up thoroughly, then run hard or do a hill repeat for one to two minutes. Stop and watch your heart rate monitor. As soon as your rate drops one beat, start timing. After 60 seconds, see how many beats per minute it has dropped. In general, a one-minute recovery rate in the 30s is good and 40s is great. The bigger the number, the fitter you are. This is the point at which your body can't clear lactic acid as quickly as it's being produced. In other words, it represents the highest aerobic effort that you can sustain for a prolonged period of time — and you can improve your lactate threshold if you train hard and smart. Dr. Lodge (of the Younger Next Year series) explains a way to test yours: "Pick a day when you haven't run hard for two or three days, warm up for 10 minutes, then run the hardest pace you can sustain for half an hour, ending as strong as you started." Your average heart rate for the last 20 minutes of your run will roughly correspond to your lactate threshold. If you try the test a month later and can run it at a higher average heart rate, you've increased your lactate threshold — and your fitness. When it comes to losing weight, exercise alone won't cut it. "You can eat your way through any level of exercise very easily," says Dr. Lodge. The key to losing weight and still running your best: Eat fewer calories than you burn, and consume high-quality, nutrient-rich foods. These numbers will help you do that. Rating your appetite can help you reduce your calorie intake and lose weight by preventing overeating. In his book The Blue Zones, author Dan Buettner explains that the Okinawans of Japan (who live very long lives) adopt the concept of hara hachi bu ("Eat until 80 percent full"). The hunger scale is similar: On a scale of 1 to 10, where 1 is ravenous and 10 is stuffed, eat when you're at a 3 or 4, and stop when you reach a 6 or 7. Never get too hungry (or you'll eat more than you need) or too full (which means you may have consumed too many calories). Follow these eight nutrition rules for healthy eating and shrink your waistline. Eating at least five to six one-cup servings of fiber-rich vegetables a day can really boost your weight-loss efforts. How? They're less energy-dense than most other foods. That makes them a good choice if you're trying to eat fewer calories. Fiber also makes you feel full and more satisfied. So by eating lots of high-fiber veggies, you can reduce your total intake without feeling hungry. Leafy greens (like spinach and kale) are especially low in calories and rich in fiber. Servings of the "Not So Healthy Stuff"
The number to aim for here: as few as possible. Refined grains, products with added sugar, fast food, sodas, and processed foods tend to be high in calories but provide very little nutrition. The more you can cut back, the easier it will be to trim your total calorie intake and lose weight. The key is to not feel like you're depriving yourself; start by substituting a healthier option (a half-ounce of dark chocolate instead of a bowl of ice cream) and reduce how frequently you indulge (from three cans of soda to one). As you exercise harder and become faster, you burn more calories. If you also watch what you eat, burning all those calories will lead to weight loss. John Colver, a fitness coach in Seattle, gives his clients "milestone" workouts each month to test how their running is improving, and notes that the workouts themselves often lead to weight loss. "Speedwork in particular has the added benefit of increasing an athlete's metabolic rate, which increases the rate of weight loss," he says. Once a month Colver's athletes run a mile on a marked track. "It's a surefire way to see accomplishment over time," he says. You can do a time trial on any course you regularly run — for example, a loop around a lake or a point-to-point running trail. Daniel Forman, M.D., director of the exercise testing laboratory at Brigham and Women's Hospital in Boston, suggests wearing a heart-rate monitor while doing the exact same treadmill workout every few weeks. For example, run at a five percent incline at 6.5 miles per hour for 10 minutes, and record your average heart rate. Do the same test every month and compare the results; as your fitness improves, your average heart-rate for the same exercise will decrease. Research shows that healthy runners can expect to race about two seconds per mile faster for every pound they lose. Jason Logue started tracking both his race times and his weight loss in 2006. He got fitter, faster — and lost weight, too. His performances in Pittsburgh's Great Race 10-K speak for themselves: In 2006, he ran 53:57; in 2007, 52:26; and in 2008, after losing 60 pounds, he ran a far speedier 49:26. Increasing how long you can run will help you burn more calories and boost weight loss. Jared Reeder, a creative director in Atlanta, built up his endurance by counting the minutes he could run before he was out of breath. When the then-overweight Reeder first started, he could only go three minutes, but slowly built up to 20. Now he's run four marathons — and is 55 pounds lighter. Your hydration level and even the room temperature can affect the accuracy of these devices. Calipers or even the "Holy Grail Pants" test will give you a solid idea of your progress for less money and fewer headaches. It doesn't matter if your max is 180 and your buddy's is 200. Everyone is different.Your max is determined mostly by age and genetics — not by how hard you train. Healthy BMI ranges are quite large (a 5'4" woman could weigh anywhere from108 to 145 pounds and still be in an "acceptable" range), so it's only useful if you're significantly over- or underweight. And the formula doesn't hold up with very muscular athletes. A 5'10" 209-pound man, for example, with just10 percent body fat is actually considered overweight by BMI standards. 3: Ounces of whole grains you should eat every day. That's equivalent to about one cup of high-fiber cereal, one slice of wholegrain bread, and half a cup of brown rice. 5 to 6: Servings of meat, beans, and nuts you need daily for the right amount of protein. Many runners mistakenly assume they need more. Mix up your carbs and add nutrients to your diet with these tasty pasta alternatives. 25 to 35: Grams of fiber you should eat every day. Get it from legumes (a cup of lentils has 16grams), vegetables, fruits, and whole grains. Remember whenever you read articles/books or watch/listen to tv or lectures, engage your mind. Read/Listen ... then consider and make use of what is actually useful to you. If it sounds too good to be true, it probably is. 2009 is dead and gone...2010 bring it on! 2009 has come and gone. It was an eventful year overall. It was an eventful year in my life to be sure. I started 2009 off with a bang. Grand intentions and all that. However I did not quit, and I did learn. I am walking, without knee surgery. That in itself is a major victory. A story of determination. Frankly; I’m kinda amazed that I am walking. Even able to workout again. I didn’t do so great on the weight loss front. I had lost 26 lbs. I crashed and gained 16 of that back for a total weight loss for the year of 10 pounds. Not overly thrilled with that, but it is better than a weight gain. So it’s go on from here. 140 pounds to lose to meet my goal weight. On the positive side, many of the issues that triggered the compulsive eating that packed the 16 pounds back on me have been recognized. I would love to say they have been dealt with and will no longer be issues in my life. I can say there is progress. To say I will never have to deal with the disruptive issues would be a fallacy, a false fantasy that would set me up for failure and pain. What I can say is that I am healthier, stronger, have developed additional coping skills, and am more prepared to deal with life’s challenges than I was last year at this time. Looking back over the past 2 years, I can see that I have come soooooo far. There are still ups and downs in my life, the emotional rollercoaster bit ya know. However so much has been ferreted out and confronted. I would say dealt with, disposed of… but then I am likely to find more emotional land mines buried in the fat hanging on my body. There is a new calm, a new determination to go forward no matter the cost. A new confidence that whatever comes up; I can deal with it. One way or the other. One step at a time. Doesn’t have to be perfect. Can be extremely messy, it doesn’t matter. One day one step at a time… neat, messy, disaster area…no matter… one day one step at a time…. This is a major change for me. No more of the “it’s gotta be perfect” or I’m not doing it at all bit. Methinks this is going to be a grand year.